Pinching, shooting or sharp pain in the base of your foot? Learn more. Morton’s Neuroma is a compression injury to the nerve between the toes, which causes enlargement and thickening of the nerve. This enlargement and thickening of the nerve then takes up more space in-between the bones of the toes, leading to increased compression and more frequent pinching of the nerve. Morton’s Neuroma is when the nerve is compressed or pinched a sharp shooting pain, burning or numbness may be felt in the ball of the foot effected. It commonly affects the nerve that travels between the bones of the third and fourth toes. This area is prone to compression due to the anatomy of the nerve, as it splits at this region to form the plantar digital nerves. The transverse metatarsal ligament (the band connecting the toes) can also cause compression on the nerves whilst walking. Morton’s Neuroma is more common in females, due to fashion footwear choices. Due to the ongoing thickening and swelling of the nerve from pressure, if left untreated permanent nerve damage and irritation in the area may occur. Compression from anatomical structures in the foot. Excessive rolling in of the feet (causes the foot to be a loose bag of bones and more likely to trap the nerves running between the toe bones). High heels (more weight placed on the balls of the feet). 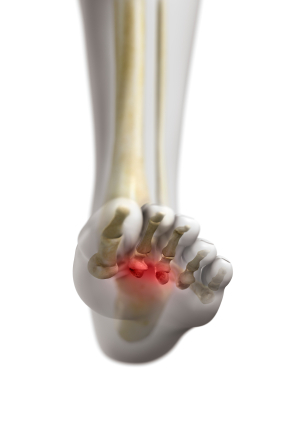 Narrow toe box in shoe causes the bones to “squash” and compress the nerves in the forefoot. Nature of pain can be sharp, stabbing, cramping like, dull or burning. Aggravating factors include: weight bearing, pointed shoes, high heels, thin-soled shoes and tight socks. Alleviating factors include: rest, removal of shoes and socks and massaging the affected area. Positive crunch test preformed by the podiatrist. Suitable footwear with a wide and deep toe box. Orthotics to correct biomechanical abnormalities. Well Heeled Podiatry can assist in reducing the pressure and compression of the nerves that run through the bones of the feet and prevent pain and nerve damage.